bl.uk > Online Gallery Home	> Online exhibitions	> Asia, Pacific and Africa Collections	> Palace & gardens, Deeg. 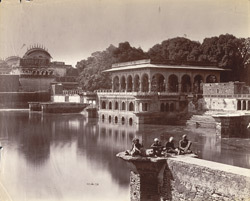 Photograph showing part of the Garden Palace at Deeg, near Bharatpur in eastern Rajasthan, taken by William Henry Baker in the 1880s, part of the Bellew Collection of Architectural Views. Deeg is a small town which was once the summer retreat of the rulers of Bharatpur 22 kms away. It was developed by the Jat chieftain Badan Singh (ruled 1722-55) as the capital of his newly founded Jat kingdom forged by uniting the members of an agricultural caste in the Mathura region. The greatest of the Jat rulers was Suraj Mal (ruled 1755-63) who shifted the capital to Bharatpur while filling Deeg with pleasure palaces. This is where the warlike chieftains could take a break from skirmishes as they continuously troubled the neighbouring Rajputs and the Mughal empire in the anarchic period of its decline. The garden palace of Suraj Mal (1760) has pavilions set around Mughal-style gardens filled with water features, fed by two reservoirs, the Gopal Sagar to the west and the Rup Sagar to the east. At the height of Suraj Mal's power he took Agra in 1761, but was killed two years later while attacking Delhi. Jat power declined, they were driven out of Agra and defeated by the Mughal army in 1776, but the state survived and the royal family lived in the palace till the late 20th century.